Okay this post is pretty old because it's from our work Christmas party last year but I've only just gotten around to uploading the photos on my computer. Someone should look into the correlation between going back to work after new year's and the subsequent increase in blog posts. 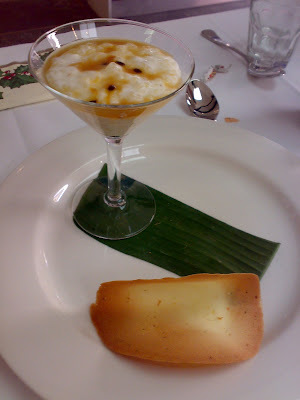 Anyhow, here are the photos I took for posterity... ahhh those sweet tasty memories! 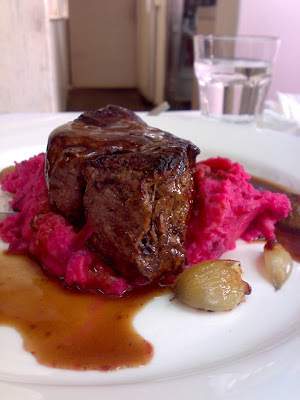 Char grilled eye filler served with lashings of beetroot mash, roasted shallots and oxtail jus. 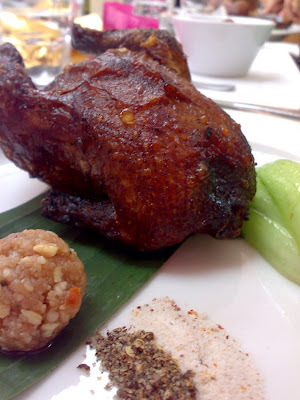 Roasted whole baby chicken with spiced sugar and salt, fragrant coconut rice and cashew sambal. 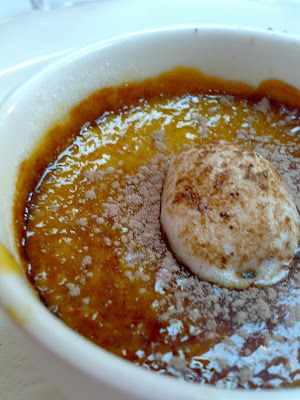 The espresso brulee was really impressive, and given our previous effort at making it- this version begs for us to try soon! Of all the options on offer, I was fortunate enough to sample a little of each but it was brought to my attention that a few people were changing seats to have second helpings! I surprised myself at having consumed the whole chicken and would have been even better if there there was something to mop it all up. Another curious thing was that some people were complaining of numb and tingling lips from the spice mix, possibly from the Sichuan pepper- overloading the taste sensations! at 10:39 pm Posted by M? Ahh the Leveson. That used to be the choice place to go when I was working on that side of town. Sadly I'm too far away now, but from the pics it certainly looks like its worth the trip! Some very interesting combinations there. Love the colour on the beetroot mash!